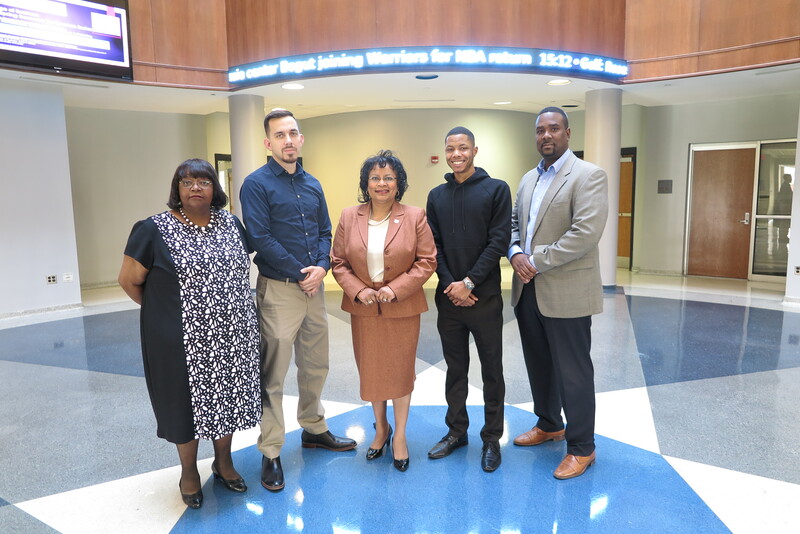 Pictured from (Left to Right): Janice May, Thay Montgomery, Dr. Sheila Porterfield, interim dean for the College of Business, Cordarius Robinson and Larry Day, visiting instructor for Finance. The National HBCU Stock Market Challenge and Financial Literacy Campaign is an educational and competitive event designed to help educate students in the areas of financial literacy as well as savings and investing. The challenge is sponsored by the National HBCU Business Deans Roundtable and Harris Stowe State University, in conjunction with Stock-Trak, Inc., Rise Display, and FactSet. In October, each student participating in the challenge was given a virtual $100,000 to create a stock portfolio. Additionally, they were required to complete 20 financial literacy lessons with topics including banking, budgeting, building credit, managing debt, savings, investing, insurance, taxes, and retirement. College of Business student Thay Montgomery earned second place among his peers from FactSet. The company will provide Montgomery with a pre-interview coaching and a fast track final round interview for full-time employment with FactSet post-graduation. COB students Janice May and Cordarius Robinson also finished among the top 20 competitors. Other student participants represented the following HBCUs: Howard University, Savannah State University, Alabama State University, Florida A&M University, Xavier University of Louisiana, Prairie View A&M University, Southern University and A&M College, Fayetteville State University, Tuskegee University, Stillman College, and Hampton University.